I know they strongly considered what will now be the downtown elementary school location, which I think would have been a better fit and provided a bit of a bridge between the Arts District and Film Exchange. It also would have allowed for more of a critical mass of these arts venues. That's a lot of land. I wonder how much of it will be empty or parking lots. I like the idea that we seem to be coming more downtown-centric, but I would have hoped for a higher density use for that land. Do we know how they're going to fund their building? I hope the contractors/architect/engineers know what they are doing with regards to soundproofing! I also feel like this is a strange fit for Auto-Alley, but I'm glad someone will make use of this space especially if it brings traffic to the area. I'm still hoping for some residential along AA at some point. Now the $38 million dollar Boomasada development makes perfect sense. If I were a tin hatter, I might wonder if the movers and shakers long standing desire to clear out the Fairgrounds of all things not horseman related had anything to do with why that quiet zone never went into place. However, as I'm neither a tin hatter nor a quiet zone proponent, I imagine I'll ponder on other things this weekend instead. I ditto the comments of G. Walker about this location. This site is not far from the Arts District or Film Row, but it is nonetheless elsewhere. I favor the concentration. I too had heard that this group wanted the site where the new school will be located. This planned location definitely seems better than the current fairgrounds site. Honestly, either this needs to go in the Arts District, or we need to reevaluate how we're branding the area along Walker. What if the City Arts Center used the old Stage Center?? I was excited when I first heard that the City Arts Center was wanting to move downtown, because they do a lot of great exhibits that go unnoticed on the fairgrounds. I just would rather this take advantage of the best opportunity available because too many other things aren't taking advantage of the best opportunity. Why is it OK to close down the street? Honestly, either this needs to go in the Arts District, or we need to reevaluate how we're branding the area along Walker. I fought and lost that battle here on OKCTalk when the Banjo Museum went to Bricktown and the proposed Toy Museum also was recommended for Bricktown. They should rename the Arts District to Civic District because that is really the only unifying theme that exists there. Are there any incentives for being an arts entity in the "Arts District", or just wishful thinking? Seems like there is plenty of land over there...just none so visible as they want. Nothing more than whistling in the dark, and in this case, they found a tune and named it Arts District. I do get the sense that the supporters of Auto Alley were disappointed to lose IAO to Film Row. I'm sure that many of them probably feel this helps make up for it. We need activity (particularly at night) in that area of AA. It also occurs to me that the park out front might offer a great opportunity as a canvass for large outdoor exhibitions. The park is very underutilized. I do wish they include some leasable space for restaurant, bookstore, or some other element to make it semi-mixed use. It would be awesome if they could do something similar to what Tulsa is doing with the Matthews Warehouse/TU/Philbrook/Living Artist Space/etc collaboration project, but I just don't think they have that kind of resources, and certainly there is no Kaiser Foundation here to sweep in and bankroll our private civic-oriented projects that don't have any other backing. My understanding is they funded the OKCMOA? 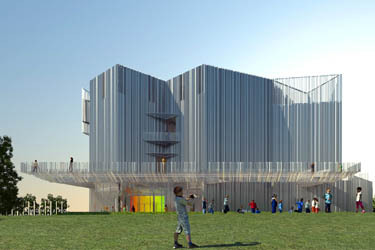 The facility itself won't be anymore conducive for art exhibits than children's museum exhibits, granted, but the theaters would be an amazing space to run a film program. Downtown OKC needs somthing like the Circle Cinema in Tulsa that runs art films continuously. 2 screenings a day at the OKCMOA isn't cutting it, plus their two showtimes a night are becoming standing-room only. The building has been home to City Arts since the organization was founded in 1989 by a grant from the Kirkpatrick Foundation. More than two decades later, the foundation that gave the group its start, and helped it thrive over the years, has its sights on moving the organization to a more visible location in a new building. Where once the fairgrounds was a hub of culture, with City Arts and the Oklahoma Art Center, the group’s board saw that the center of arts and culture in the city had shifted Downtown. About three years ago, they began looking seriously at options for renovating an existing building or finding available land. County records show the foundation purchased 4.5 acres at N. Broadway Avenue and 12th Street for $3.5 million in late March. With the land secured, it will provide a site that is in good company for City Arts: Allied Arts, the Oklahoma Arts Institute and the Womb gallery are just a stone’s throw away. Now the questions are: What it will look like? How big will it be? How much will it cost? “It’s difficult to answer that until we address some of the issues of selecting an architect and putting together some drawings where we can get a real sense of pricing,” Eickman says. While City Arts continues to offer exhibitions and classes for adults and children, to grow and prosper it will require a customized space that fits its needs, and to accommodate things such as year-round exhibitions of local, national and international artists. Mary Ann Prior was hired as executive director in 2009 to help with the transition. Initial plans call for the new facility to open in 2015. “With Mary Ann on board, we began the whole planning process,” Eickman says. Prior is a professional curator who last worked overseeing the corporate art collection of Bank of America at its offices in Europe. She says the programs and exhibitions at City Arts are top-notch, yet many have no idea it exists, have no idea where it is, or may think it is just a part of the State Fair. Prior says the new building likely will be between 40,000 and 50,000 square feet. The available land also will offer the potential for future growth. The current space is about 36,000 square feet. The new spot also will be set up as a place to grab a bite to eat and drink, as Prior says plans call for a cafe and a bar. Access and visibility also will be improved. With students and visitors coming from around the state, the site easily is accessible from Interstate 235. What kind of design would you like to see? I'd like to see something that really pops so if you were to look at it you'd know it probably has something to do with art, but not too tacky. Something that pops as far as architect, not something that pops because it's bright and has a million colors like The Womb. What if this project and the convention center could switch plots of land? The City Arts Center would be an amazing thing to have wedged in between the two parks, and if they're only wanting 50-60,000 sf you have plenty of room to preserve a green spine. Logic -- HA! That'll have to be curtailed.